What Is a Ketubah & Do You Need One? 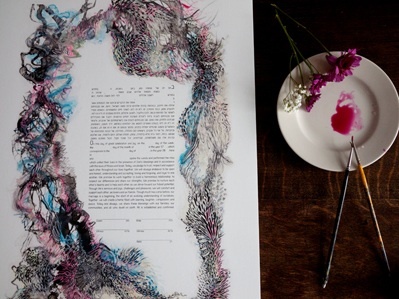 Wedding > Inspiration > What Is a Ketubah & Do You Need One? From face painting to music at GigMasters we love any tradition or trend that helps talented artists make a living creating art. That's why we were so excited to learn about the new trend of couples from all heritages having special art created in the form of a Ketubah. We asked our friends at Ketuv to explain the tradition and why it's catching on. Special to GigMasters from Arielle Angel of Ketuv. News outlets (most recently The Huffington Post) have just begun reporting what we at Ketuv have known for a long time: ketubahs, a rich and integral part of the Jewish wedding ceremony, are not just for Jews anymore! What’s a ketubah? A centuries old Jewish tradition, the ketubah is a marriage contract signed at the wedding to unite the couple by law. For as long as there have been ketubahs, people have been decorating them and making them beautiful. Nowadays, people will often hang their ketubah in their homes, as a reminder of their wedding and the promises they made to one another on that day. Why get a ketubah? There are many reasons for couples to include a ketubah in their wedding ceremony. For Jewish and Interfaith couples, it may be a meaningful way to incorporate one or both of the partners’ roots. However, even if the ketubah is not a part of your heritage, it is a wonderful way to connect to your partner and commemorate your wedding. The text of the ketubah outlines the terms of the marriage. In other words, they are your wedding vows. Many of our customers tell us that the act of signing their ketubah—and signing those vows—was the most emotional part of their ceremony, the moment when they first felt like husband and wife. Add to this the fact that the ketubah is a work of art, and you’ve got an heirloom: a beautiful, visual representation of your marriage, and the oaths that you and your partner have made to one another. What we at Ketuv always say is that long after the flowers wilt and the photos are shelved, the ketubah will still be there, on your wall, to remind you of your special day. What should your ketubah look like? For a while, most of the ketubahs on the market looked alike, with the vast majority featuring two intertwining trees. Ketuv knows that for the modern couple, Jewish or not, this just won’t do. That’s why we asked over 20 contemporary artists to create ketubahs (sold in limited editions of 50) that don’t look like “ketubah art” as you know it. Instead, Ketuv ketubahs just look like art. This is good news for Jews and non-Jews alike, as Ketuv’s ketubah art is fresh and unique. For couples looking for an artwork that reflects their personal story, most of our artists are available on the site for custom work. Your ketubah can feature anything from a portrait of you and your partner, to the place where you got engaged or a hobby you share, to more abstract or symbolic elements. It’s up to you! 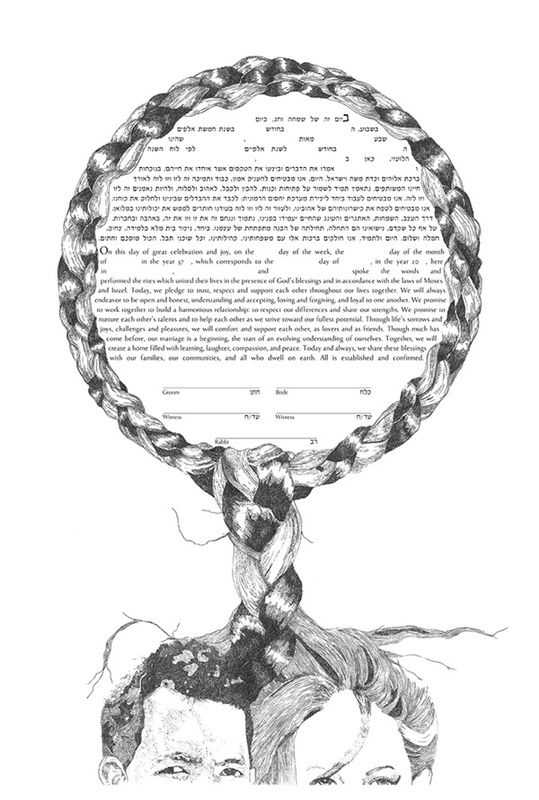 The ketubah can be a practical, meaningful and beautiful piece of any marriage ceremony. To learn more about ketubahs, and to browse some of Ketuv’s ketubah art, visit www.ketuv.com.